Salad is my go-to way of getting more veggies in my family’s diet. I love homemade salad dressings but looking up the recipe, checking and rechecking for amounts and measuring seemed to take too much time for an ordinary week night. But, there’s an easier way! If you can remember a couple of quick ratios, the rest can be done by estimation and taste. The absolute quickest way to dress a salad, and one of the tastiest is to sprinkle the greens with red or white wine vinegar, drizzle with olive oil and toss with kosher salt and fresh ground pepper. No need to remember ratios or measure anything. 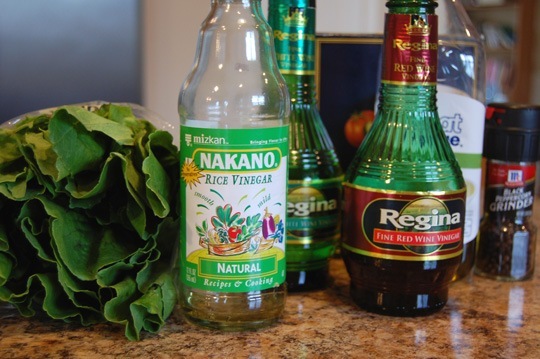 To make a simple vinaigrette use 3 parts oil to 1 part vinegar. Another way to think of this is 1 Tablespoon of oil to 1 teaspoon of vinegar. Simple, right? You can use olive oil or vegetable oil. I like either red wine or white wine vinegar, but balsamic is also good. Also try flavored vinegars. Use your imagination and let your taste buds enjoy your creations. You’ll come up with all kinds of interesting combinations to complement your main course. Stir together equal parts of sour cream and mayonnaise. You can use low-fat versions to make it healthier. Some people like it a little heavier on the mayo than sour cream. Don’t be afraid to experiment. Fresh garlic or garlic powder – fresh garlic can be minced or crushed or you can use a fork to mash a clove of garlic with some kosher salt. Play around with it, tasting and adding. As you experiment with making homemade dressing, you’ll find your perfect flavor combos and you’ll be able to fix it in a flash! Tiffany King shares recipes, menus and complete grocery lists on her site Eat at Home, Everyday Food for Busy People. She’s married with 4 children who range in age from 18-7 years old, a couple of which are willing salad eaters. The others have to be encouraged. mix equal parts cider vinegar, miracle whip, milk & sugar (plus a dash of salt & pepper) – shake to combine & enjoy over summer lettuce, cucumbers & tomatoes. I have been making my own dressing for a few years now. Once you go homemade, you can never go back! Thanks for the easy tip. Whenever I buy a bottle of salad dressing, I always seem to end up throwing over half of it out, due to our family’s differing preferences. I love the idea of making my own dressing using ratios, so I can make as little as I need. Thank you so much for sharing! @Melissa, Great idea to use cottage cheese! I tried ranch dressing with Greek style yogurt, but something was off. My kids love ranch so it would be good to make it healthier. Does anyone have a good dressing recipe to go with Tomato ,mozzarella , and basil salad? @Christina Kelley, Christina, try drizzling with extra virgin olive oil and sprinkle with Kosher salt and freshly ground pepper. That salad is so good! One of my favorite things to eat. I love your website and this post in particular. I am trying to lose weight. The 3:1 ratio is for regular salad dressing (I am assuming). If I wanted a reduced fat can I substitute water for half of the oil? Balsamic vinegar is so good on tomato salad. No need for any oil.